The Boho Birds Punctuation bulletin board allows teachers to introduce punctuation marks one at a time and then display them for easy reference. 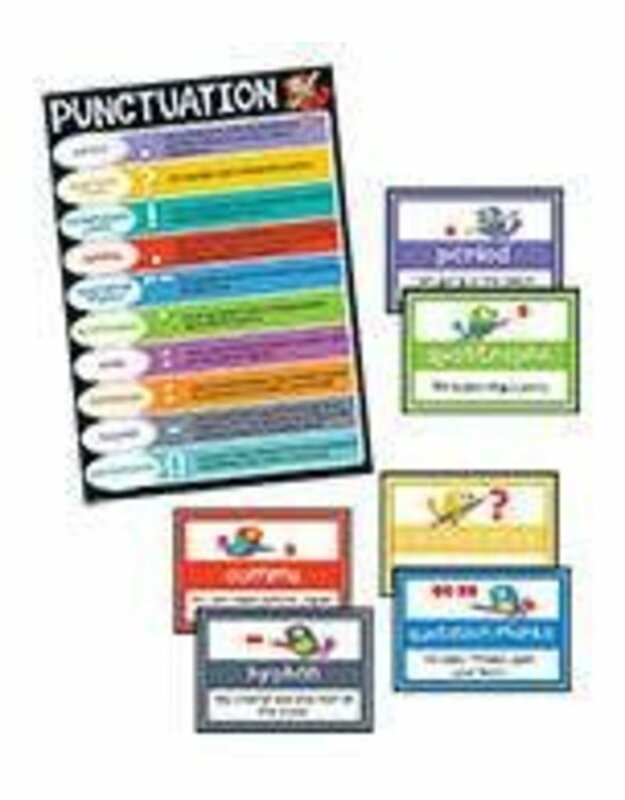 --This 11-piece set includes: --*1 large chart --*10 small charts --*Resource guide --Each small chart features one punctuation mark, the name of the punctuation mark, and a sentence that shows the punctuation mark in use. The small charts are color coded to the large chart. The large chart includes 10 punctuation marks (period, question mark, exclamation point, comma, quotation marks, apostrophe, colon, semicolon, hyphen, and parentheses), paired with an explanation on how to use each one. --This eye-catching, contemporary Boho Birds design will brighten any classroom! Carson-Dellosa curriculum bulletin boards are designed to support any classroom with hardworking, curriculum-based displays. With limited display space in the classroom, curriculum bulletin board sets allow teachers to create colorful, attention-grabbing displays that make learning fun.